Does your home have area rugs that decorate and protect your floors? If so, can you recall the last time you had them professionally cleaned? Cleaning your carpets and rugs may appear to be a DIY project. However, before you launch headlong into doing it yourself you may want to consider having a professional do it for you. Naturally, your next question will most likely be, “but where can I get an area rug cleaned?” Thankfully, Steam Master Carpet & Upholstery Cleaning, Inc. is here to meet all your deep cleaning needs! Today we want to share with you reasons why you should have your area rug cleaned by a trained professional. Over time both rugs and carpets collect dirt, grime, pollutants, allergens, germs and more. Soiled rugs can literally hold pounds of unwanted dirt etc. As the grime works its way into the fibers of your beloved rug it will inevitably cause it to break down. Although regular vacuuming is needed as regular maintenance of your area rugs it cannot clean deeply and remove the buildup completely. You may be tempted to rent a steam cleaner from a local retail store but even they do not provide the best quality solution. The machines that are available to rent from retail stores are not always clean and you have no way of knowing which environments they have been in. In fact, when you turn a machine on you could be introducing something into your home environment that could be harmful to you and your family. Steam Master Carpet & Upholstery Cleaning, Inc. has state-of-the-art equipment that is not available to the general public that can provide a thorough and hypoallergenic clean. 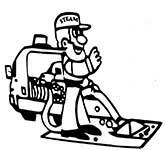 Here at Steam Master, we have experienced and highly trained professionals who are IICRC certified. We are a family owned company with combined experience of over 30 years in our industry. We are trained to handle most any issue or fabric that a rug has. Since every rug is different and is made with different materials, they will need varying methods of cleaning. Heavily soiled rugs may need to be submerged in a solution before any cleaning can begin to loosen the compacted debris that is trapped within them. After the debris is loosened the washing techniques can begin. After your rug has been thoroughly washed, we will then lay it flat to dry to avoid any distortion in the fibers. We will then use high-velocity air dryers and dehumidifiers to dry your area rug as quickly as possible. Once dry one of our staff will closely inspect your rug for quality control and note anything that they feel you will need to know. Often these techniques require us to perform area rug cleanings at our home location. That is why we offer free pickup and delivery for your convenience. Stubborn stains, odors, and spills on your area rug can leave it looking unsightly. Because our staff is certified we can address these issues with care and expertise. We will give you our honest evaluation of what can and cannot be done. Regardless, once your rug is back in your home it will be freshened and ready for you to enjoy for years to come! Steam Master Carpet & Upholstery Cleaning, Inc. take pride in providing you with the best solutions to care for your area rugs and more! We offer pricing upfront with no hidden fees and we stand by our quotes. Contact us today for all your deep cleaning needs! PrevPreviousCan a couch be professionally cleaned?